Family Day isn't usually much of a big deal for us. In the past it has been very much like any other weekend day, the only thing special about it being that my son got the day off school. This year, I decided it would be different. This year, I decided that we would actually celebrate Family Day and what it is meant to be. And I turned to my six year old for help. I asked him what he wanted to spend our Family Day doing together. He thought about it for a moment and then told me that he wanted to have a party. A Family Party. So, together we sat down and planned our very own little McFarlane Family party. We planned food and activities and decorations. Then off we went in to Pembroke to get everything we would need. First up was lunch. My son chose pizza and cupcakes. Good, reliable party food. Yum! Cupcakes, of course, are a must for any party. Our original plan had been to make and decorate our own cupcakes, but we decided that it would be cheaper and easier and save us some time to just buy some. Miss Avie really enjoyed her cupcakes and pizza! Next on the agenda for our Family Day Party was games! We stopped by my parents' house to pick up some board games and such since we really don't have much of our own. We decided to try Hi-Ho-Cherry-O first, a favourite from my own childhood. Turns out it was a huge hit with my kids, too! My three-year-old and almost six-year-old both loved it, and asked again and again to play. While we played, my daughter had her own plans. Poor Steve the Cat. Surprisingly, she was actually being extremely gentle (we've been working on using soft, gentle hands with the animals), but the look on Steve's face just gets me. "Somebody do something about this kid!" Anyway, after Hi-Ho-Cherry-O we realized that we forgot decorations for our party! 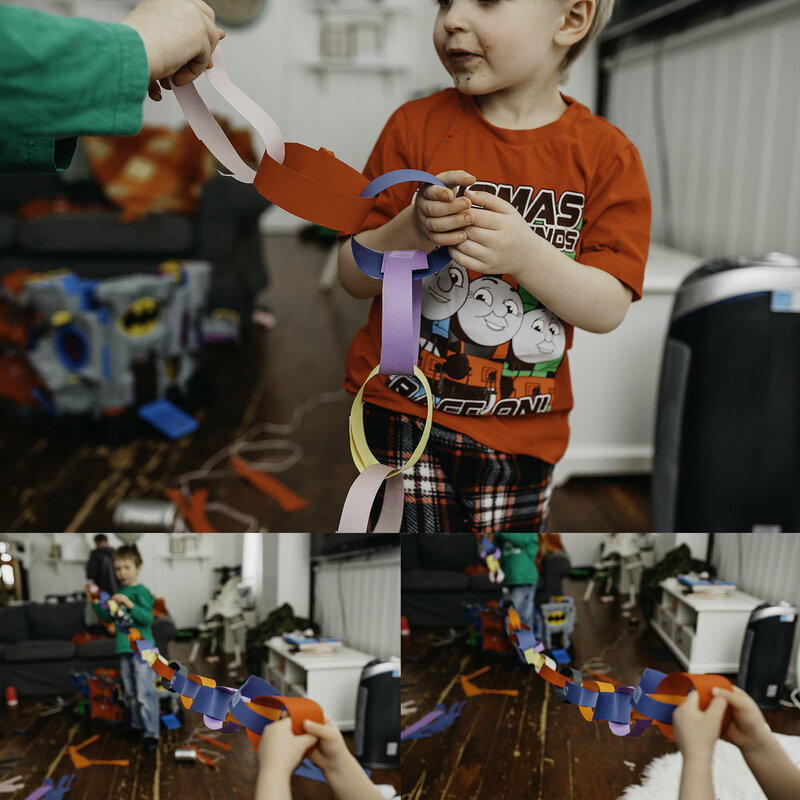 So we cut some strips of construction paper and taped together a paper chain garland. I was so happy (and extremely relieved) to see my two boys working together so cooperatively on a project. 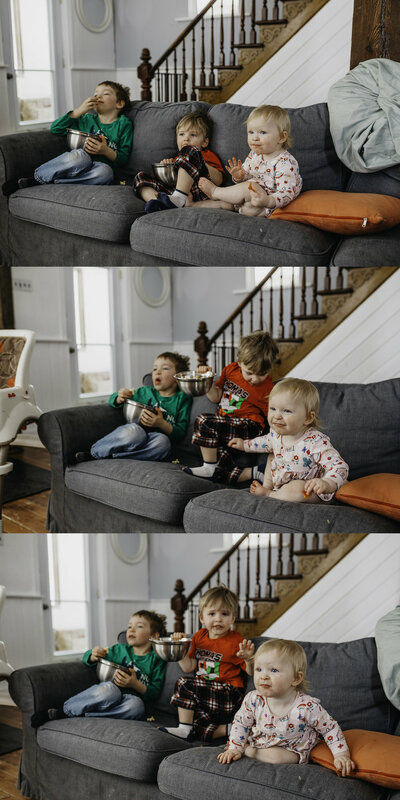 It seems that most days all I hear is constant fighting, arguing, crying, and screaming from the moment they wake up to the moment they go to bed. Seeing them working together made my heart happy and gave me hope that they won't grow up completely hating one another. My husband planned for us to play Monopoly next, but unfortunately we lasted all of two minutes. My three-year-old just wanted to play with the playing pieces and my six-year-old needed to be taught how to play before a proper game could be had. Not to mention that Avie was feeling very left out and stood at my side crying and asking to be picked up constantly. So, Monopoly went on the back burner very quickly. We moved on to the next item on my son's list. A movie. It was between Spiderman and The Lego Batman Movie. The Lego Batman Movie won. And what's a movie without popcorn? The final item on the list for our Family Day Party was a dance party. 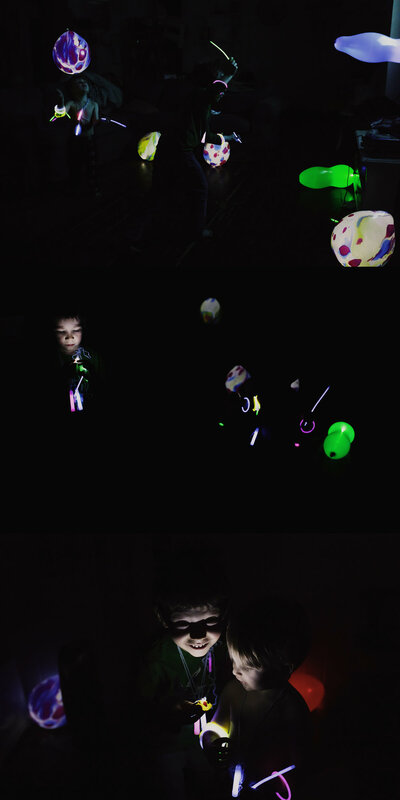 We had the idea to make it an extra special dance party by adding glow-in-the-dark balloons and glow sticks! So much fun was had!